The Spice Club arrives in Birmingham! Birmingham. Home to the balti, home to more parks than any other city in the UK, home to more miles of canals than Venice and now home to The Spice Club! That’s right, the second city has officially became our second home. 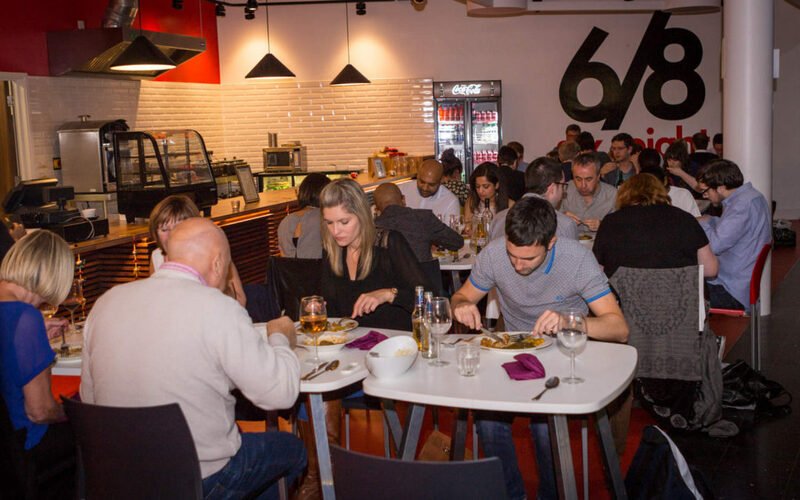 Last Saturday, the ever-cool Six Eight Kafe based in Millennium Point played host to our inaugural Birmingham pop-up supper club. Birmingham residents (or Brummies if you prefer) have a well deserved reputation of having a discerning palate for spice… Birmingham is no stranger to the “Curry House”. So I could not have been more excited to have the opportunity to showcase the “home-style” delights of the Spice Club to the national experts! After seating the remainder of our guests, we set about delivering our four course menu – one bursting with a medley of flavour, texture and colour. Dishes included Samosa Chaat, Kashmiri Lamb, Courgette Spiced Dal and Shahi Chicken Kofta (just to name a few!). We received some fantastic feedback after the event which resulted in an air punch and a breakout into my happy dance (yes I have a happy dance-doesn’t everyone?). I’ve posted a few snaps of our event below but you can browse the full album of photos here. Enjoy and I hope to see you at The Spice Club (Manchester or Brum..or both) very soon! Ps. We shall be popping up in Birmingham again very soon so sign up to our mailing list to stay posted.